K & J Trucking is celebrating their 40th anniversary of incorporation this month. In the cold February days of 1979, Dave and Sharon Koch and their investment partner Don Jerke signed paperwork to officially become a business. This past summer, Sharon was awarded the 2018 Women Empowerment & Entrepreneurship Award by the Small Business Administration for her exemplary work in a male-dominated industry. Dave and Sharon built K & J Trucking from nothing; and did it by treating people right. This is the story of the early days of K & J Trucking. 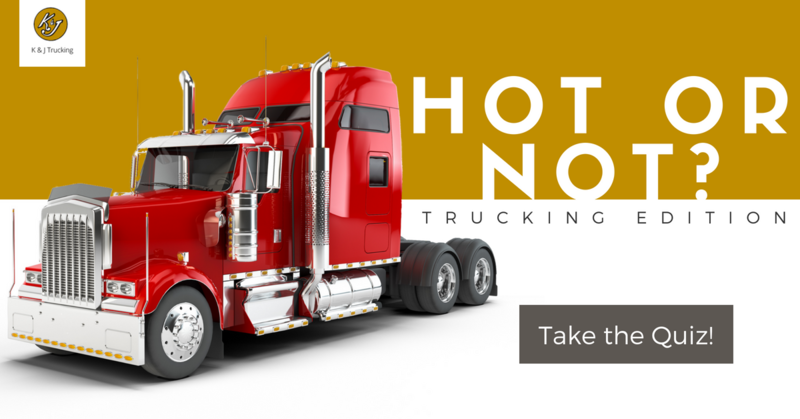 Have you been thinking about a career in trucking but you just don't know how to get started? Are you in CDL school and looking for opportunities? Are you currently driving truck and looking for a different opportunity? We are hosting our quarterly driver meetings next week, December 17th through 21st from 11:30 to 1:30. 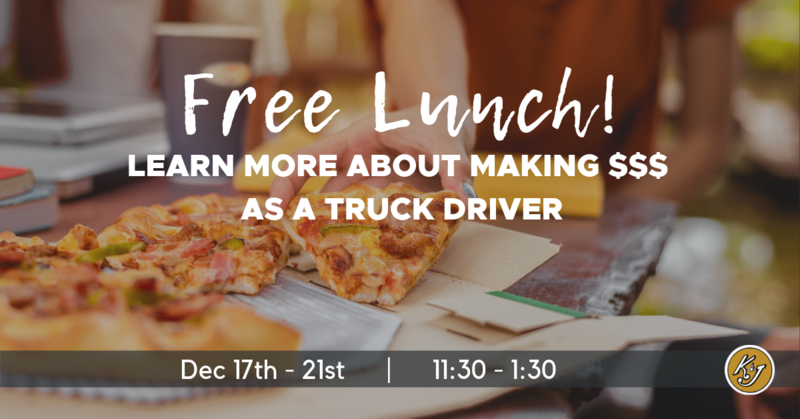 During this time we invite all of our drivers to come and eat a delicious meal with us and talk shop! This will be a great time for new prospective drivers to meet our staff and drivers and see if K & J is the right fit for you. Are you a driver looking for love? Someone who's been burned before by the long-distance nature of on-the-road relationships? Or maybe you're married or already in a relationship, but struggling to connect with your partner thanks to constant days (or even weeks) apart. Regardless of your specific status, we understand that relationships can be difficult to maintain as a driver. That's why we rounded up a few tips for dating while on the road. Or for the more sarcastically minded, check out our funny post on how to have a miserable relationship as a truck driver. K & J is proud to be participating in the Special Olympics Truck Convoy for another year. This year's event is taking place on September 21st and 22nd and we have four drivers taking part! Curious about the Truck Convoy and how it supports the mission and vision of Special Olympics or how you can get involved? Keep reading! We are excited to announce that K&J's Dan Cameron has been awarded the South Dakota Trucking Association's prestigious Truck Driver of the Year award for 2018. Two other K&J drivers, Josh Becker and John Snowe (pictured below), were also honored to be finalists for the award. K&J drivers were honored for their commitment to safety this weekend at the South Dakota Trucking Association annual meeting. 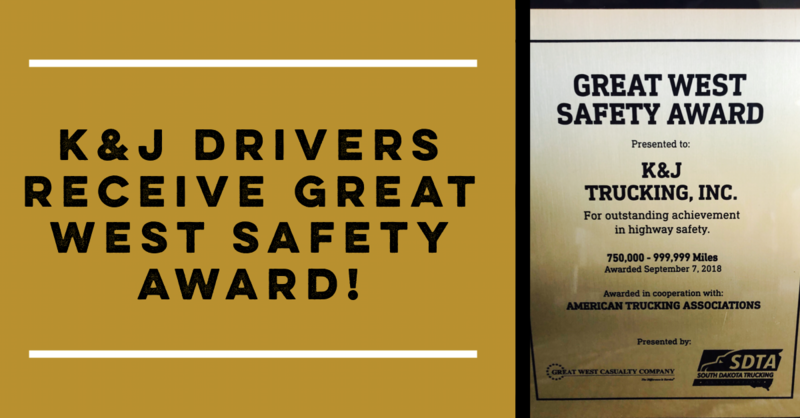 K&J was presented the Great West Safety Award awarded in cooperation with the American Trucking Association and presented by the Great West Casualty Company and the South Dakota Trucking Association. One of the things we pride ourselves on at K&J is providing the best equipment out there to our drivers. We had one of our mechanics, Ryan Charette take us on a video tour of the new 2019 rigs in our fleet to show you what you can expect if you come to work for K&J Trucking. 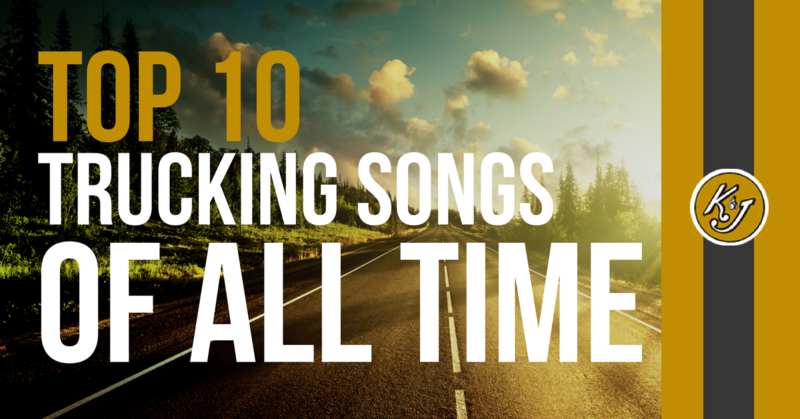 Trucking has certainly inspired its fair share of music over the years. There is something poetic about the beauty of the countryside and the sacrifices of so many dedicated drivers that has made for some of the greatest music of all time.We decided to ask two members of the K&J family to share their all time favorite trucking songs; one is old-school and the other is a youngin'. From haunting lyrics to driving beats, let's see what they came up with! From inspections and road check to big changes like hours of service and the switch over to ELDs, the Department of Transportation has all sorts of rules and regulations that affect our industry. 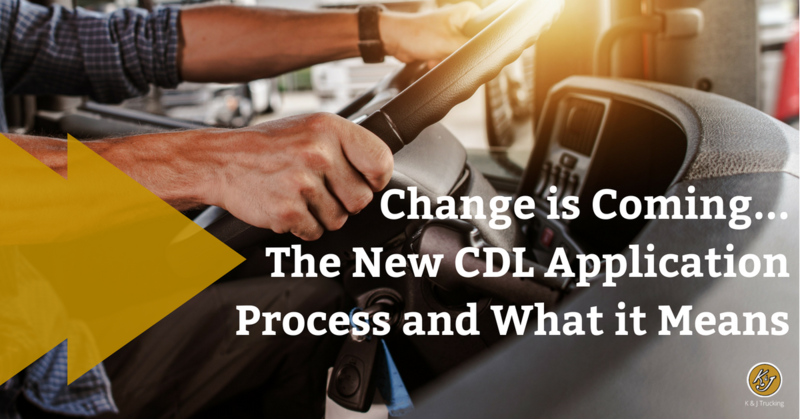 Now that we all have our ELDs or AOBRDs, the next big change the DOT is making is to the application process necessary to get your CDL. This process will be tricky and take time to get used to, so we think it is best to be prepared! Keep reading to find out more about what you can expect in the years to come. Back in the early 2000s there was a popular site called Hot or Not where you could rate people based on their general attractiveness. In the spirit of fun, we have created a brief quiz allowing you to rate a variety of trucks as "Hot" or "Not". Are these tricked out trucks or big rig fails?